Years of experience working with organizations of all sizes has led us to where we are today, improving business practices with advanced predictive analytics. Where digital innovation awaits all of you, we embrace companies who look forward, and who want to get that step ahead. Doing business in a global environment challenges you to outperform, being able to cope with influences internal and external. Grasp your potential, discover how advanced predictive analytics help you achieve better decision making, both on strategic and tactical horizons, and which empower you with advanced market insights. Our consultants are your trusted advisors from start to finish. They have in-depth technical knowledge combined with process knowledge, making them the perfect sparring partners for an advanced data analytics approach. We provide customized forecasting models, enabling you to outperform those competitors! Our experienced and high qualified business analysts help you uncover correlation patterns and use this to build advanced forecasting models. 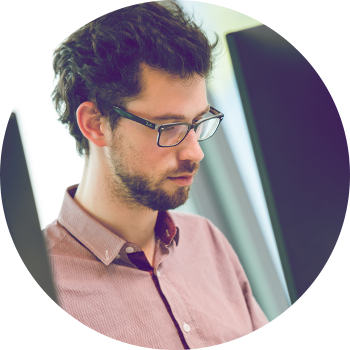 By engaging with our data analysts you have the capability to test assumptions and improve current business methods, saving you time and money whilst bringing you validated insights. At Solventure LIFe, we have innovation in our DNA. To stay ahead of the curve and deepen our knowledge, we collaborate closely with Ghent University, Lancaster University and others in the field of analytics and modeling. Building on this constant urge to excel, we developed our Leading Indicator Forecasting engine(LIFe), a software with advanced predicitive analytics, that allows you to detect correlations with external indicators, and incorporate them into your business practices, resulting in advanced business insights, better decision making and more accurate forecasts. Get to know the leading indicators impacting your business. Our advanced predictive algorithms help you define how to use this information for sales, marketing, demand planning and strategic decision making. Understand what is driving your business. Grasp & incorporate that information in your business planning processes. Validate and benchmark the leading indicator forecasts with current forecasting methods and market intelligence assumptions. Reap the rewards of your exercise. Improve forecast accuracy and make strategic decisions based on advanced market insights. 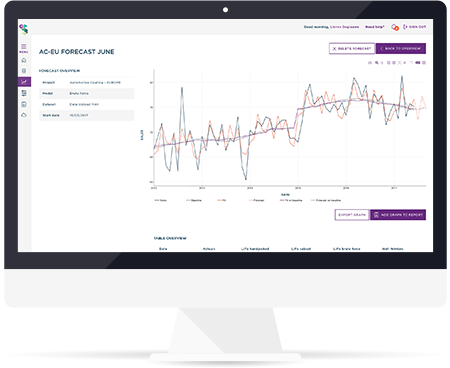 Analyse, monitor and report the impact of your bespoke forecasting method. Update and receive notifications on changes in the indicators.